Looking for three players preferably a more diverse cast, to join an online and streamed game of 7th Sea every Monday from 7pm GMT+1 until 11PM GMT+1 must have a camera and a decent mic. Where can I get in touch for support? Seems like we'll have to wait a bit longer for Khitai's release as Chaosium takes the reins. Never had a chance to back Khitai's KS, but so curious what's in store. Can any backers share what info has been released on the expansion? Saw there's a China and a Cambodia (?) update. Hey there! I'm Thomas Deeny, the graphic designer and layout person for the second edition of 7th Sea and an occasional poster/lurker here. I've just added a small card game I've been working on called The Duelists up at the Explorer's Society. The Duelists is a fast-playing two-player card game that plays in about 10-15 minutes. Duelists face off for a contest of showmanship, sport, and swashbuckling. Set 1 features “Lady” Josephine d’Ruelles, a thief savvy opportunist from the streets of Montaigne, sparring with Tàhmas O’Denagh, a modern embodiment of a historical Avalonian Knight from Inismore. Josephine is a trickster who likes to use her opponent’s tactics against them. Tàhmas is an aggressive duelist using his Knightly glamours to outlast his opponent. Set 2 features Ainsley NicBeth, the strongest warrior in all the Highland Marches, sparring with Giovanni Lucignolo, a Vodacce lover of wine, women, and men. Ainsley is an unstoppable force that seems to get stronger the angrier she gets. Giovanni is a fast-moving duelist that denies his opponent’s attacks. If you'd like to check out the rules, they are available in the full-size pdf preview. If you have questions about the game, graphic design and layout, or pretty much my time working with John Wick Presents on 7th Sea, AMA. In a duel to the death in 7th sea what happens if a fencer spares the other's life? Say a master swordsman is challenged by a brash young noble to a duel to the death. Then the youth is handily beaten by the master. If the master knocks the youth unconscious with his final blow rather than killing him what are the social reprecussions? Is the duel still technically won? Does the unconscious duelist's second have to take over the fight? Is he obligated to if he knows he can't win? So, I have been saying for sometime that 7th Sea does not handle tall characters well. What do I mean by this? When advancing a character, you can go tall (building up a single skill to maximum), or wide (building out more skills to be more well rounded). I currently run a game with 6 characters. I know, it's a lot. In addition, it's a game that has been running since I got the books from the KS. So... years. 5 of the 6 characters are Duelists. 5 of the 6 have a 5 in Weaponry. Explosions much. The 6th character has a few different advantages that allow him to help others more efficiently. Joie de Vivre. 123 raises between the lot of them in the first round of the action sequence. Just me shaking my head. Just me glad this is the final arc of this campaign. 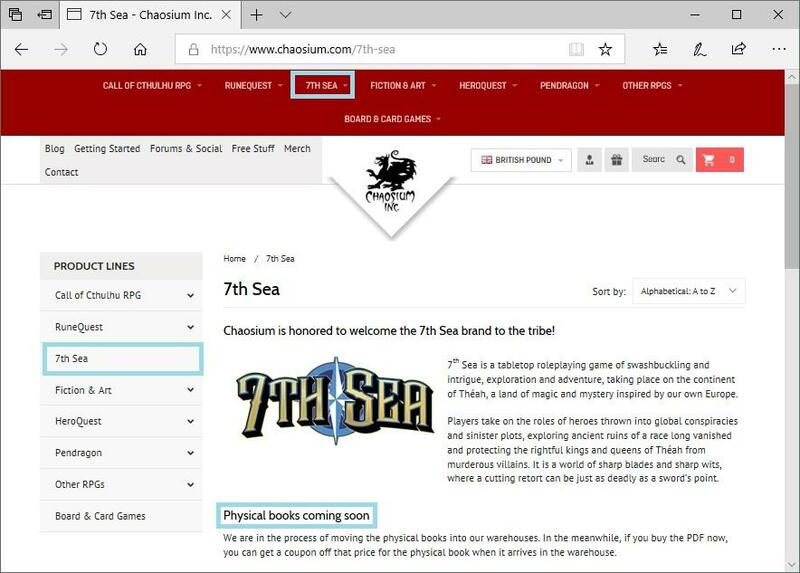 7th Sea: Khitai by John Wick » JWP AND CHAOSIUM JOIN FORCES! Has anyone converted El Fuego Adentro to the new system? If so how'd you do it? I’m reposting this here for those who aren’t on the Facebook community. After last Friday’s game, I decided what my brain could really use (when running an action scene at 11:45 pm) is a quick cheat sheet for potential villain actions that don’t involve attack/defend. As the idea has rolled around in my brain, I’m thinking of using the archetypes from Heroes & Villains. Each would have maybe 5 actions, with room for 2-3 “custom” action prompts (plus a big list of samples to pull from). You could even attach a dice pool to each action based on STR/INF for extra utility. Really, the idea is to make an easy list of prompts for my sleep-deprived brain to jump on in an action sequence. Does this look like it would be useful to anyone else? Anyone want to help out? I’ve started by pulling from the move lists from various PbtA games, but if anyone wants to suggest other resources that would be helpful, that would be great. Is there a map of the baronies/Eisenfursten territories for 2e? Sarmatian Commonwealth and "The Siege of Vienna"
Just a quick ask: Does 2.0 have a parallell to the Ottoman Turk siege of Vienna in 1683? Putting together a campaign that is basically a highlight reel of the 7 years war, the Siege of Vienna and the American Revolution. I’ve released the third part of my “Risky Things” series through the Explorer’s Society on DrivethruRPG. This one is about stealth and siege, with ideas for how to construct Risks, Consequences and Opportunities for those types of scenes. Whilst it's specifically framed around infiltrating the Villain's fortress and escaping from its dungeons, it can also be used as a template for any kind of infiltration/jailbreak/stronghold assault set-piece. I had some fans express interest in a Sorcery supplement, and I can say… it is coming, but I decided to put out this one first because Sorcery is going to be BIG. Six Risks and new Villainous Sorcerer advantages for all six of the core book Sorceries - watch this space! This is another playlist for reading/playing/DM’ing in the genres of Fantasy or Sci-Fi: a break from my dark ambient selections to a smoother, almost new age mood. Hope you enjoy! Hi I am looking for a GM to run a 7th Sea 2nd game on my twitch channel for 4 players please, every Monday night starting 7pm to 11pm GMT. Over the past year my channel has done quite a few pen and paper roleplaying games from Numenera to Blades in the Dark, each show would often have 15+ viewers, and growing. You will need to have a webcam, and microphone/headset please. We use Roll20 as a virtual tabletop, to do dice rolls, and keep track of character sheets, and other things, we also use a program called Zoom that is free to do all the video and audio sides of things. If you are interested please DM me thank you! I'm having trouble bringing my campaign together. Session-wise, I feel like I'm about halfway through, and I haven't really given as strong a narrative as I'd like. I told my players my out early on - that I'd focus on their Player Stories over the GM story of fighting the Inquisition and Novus Ordo Mundi. Hopefully, the cool people on r/7thSea can give me their thoughts and maybe some tips. We're all having fun from session-to-session but I pride myself on usually running very above-average games, and I want this to have a good second season. A somewhat non-canon Caliberi Letters which established that Novus Ordo Mundi was up to no good. A canon Montaigne Blood which established a nasty conspiracy, and someone who tipped off the Heroes that the Marquis was in danger. (That therefore, conspirators who break with the conspiracy are to be killed.) It also established the White Branches, that you could go anywhere your heart desired - even through time - if you stepped through the forest. Gold and Shadows parts 2-4, which established that there are ancient Syrneth places that corrupt people and cause supernatural events. It also ended with the death of Don Diego de Silva, but left his network of orphan-soldiers intact and working for The Inquisition. An interlude which set up several possible big villains from the Heroes & Villains book. The Doors, a Trail of Cthulhu adventure that established that a mysterious magical lock from Vodacce or maybe the Sarmatian Commonwealth was home to a very powerful magician, and that the magic used was extremely dangerous. Fiddlers Green, which we mostly messed around and established that a powerful sea witch named Ms. Green dislikes them. Boris is a manservant of a noble family, who woke up with no memory of who they were. Turns out they were murdered and the remnants fled east. (I was thinking of running Who Killed Lord Wojek with them.) His stories are to find his master's boat, and also to kill his master's arch-rival. Steil is a warrior from Eisen. Steil has already finished one story; finding and rescuing his daughter from life as an orphan-assassin. His current is to destroy the remaining clan of orphan-assassins. Rosaline is an assassin and Los Vagabundos member from Montaigne. She wants to romance the captain of a ship, who is literally married to the sea. To that end she needs to file a divorce with the Devil Jonah. Ina, another Knight of Avalon, wants to find out what Paega (the Forgotten knight) did to be forgotten. We've dropped vague hints. My idea was t hat Paega made a bad deal with an evil entity, and had to erase herself from the books to keep anyone else from finding out about it. What 5 scenes should I include in my 7th Sea game? I'm about 50% of the way through, and I'm having some difficulty tying it together. At best I'm following my Player Stories. As such, I'm looking for what 5 most iconic scenes you can think of (or more, if you want!) that really feel like 7th Sea. This is my best dark ambient playlist for reading and DM’ing or even playing horror games, no false modesty. Check it out. Cheers!